RAINBOWS ARE FOR MEDITATION TOO! A beautiful rainbow appeared out my window this morning. Usually, the rainbow is just in my mind, as I do a 10-minute chakra meditation each morning, for peace and harmony in the day ahead. I focus on breathing in the colors of the rainbow, associated with each chakra, to strengthen and balance them. I have found that inner work is reflected in the outer world. So, visualizing a ball of golden light in my Solar Plexus Chakra, or the center of power and self-confidence, actually leads to more self-esteem in all my dealings. Breathing in an aura of green into my Heart Chakra leads me to express more love and compassion, both for myself and others. If you’d like to try the Chakra Meditations from The Chakra Diaries, they are now free to listen to and download at http://www.thechakras.org/meditations.html. 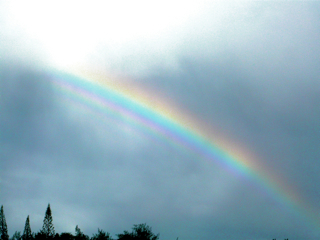 Many blessings of rainbow energy in the New Year! In my chakra balancing workshop profiled in The Chakra Diaries, one student’s fourth chakra was profoundly closed. He was as suspicious of others as a stray cat, resentful at life for handing him not that bowl of cherries that he felt he so richly deserved, but a crate of sour grapes and buckets of ill will filled with woe-is-me. No wonder that despite his rugged good looks and stable income he was having such a “hard time” finding a lover and soul mate. His inner peace was pockmarked and fragmented, it resembled a battlefield of negative feelings littered with remnants of squandered life force. He was in every sense of the unspoken word, a mess. I suggested that he passively meditate at every opportunity, allowing his memories of love and relationships to surface so that they could be examined and balanced. He taped ten affirmations of self acceptance on his bathroom mirror and car dashboard to guide him in becoming more grounded and open to love and compassion. Over the course of the workshop, I saw this delightful, yet challenging man grow into a balance of his internal and external worlds. He became more open and accepting of life and less apt to sling blame, point fingers and retreat into a fortress of self-pity. He led the group in a practice of saturation blessings and appreciations of abundance, reminding the group that blessings flow where attention goes and that all power comes from within. In the final tally, he gave to the group far more than he took and I am forever thankful that he crossed my life. Mr. Heart, I miss you and wonder what your world has become. Please take a minute away from what I imagine to be an overflowing and abundant life and write to me soon. Namaste.